The Street Glide in these years came with 16" x 3.0" wheels on the front and rear. 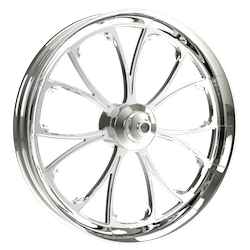 The stock size replacement wheel that we carry in every wheel style on our website is the 16 x 3.5" size. If you purchase this size wheel, you can use your stock tires and will not have to change them. On these year Street Glides, you can put a 16 x 3.5, 17 x 3.5, 18 x 3.5, 19 x 3.0, or 21 x 3.5 front wheel without changing anything on the bike at all. 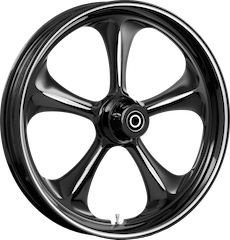 As far as the rear wheel, we recommend the 18 x 4.25 wheel with the 150/70-18 Metzeler or Avon Tire. 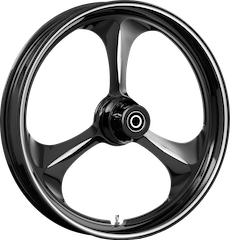 This wheel is a GREAT fit for the Street Glide, looks great, rides great, and doesn't effect the ride height of the bike at all. 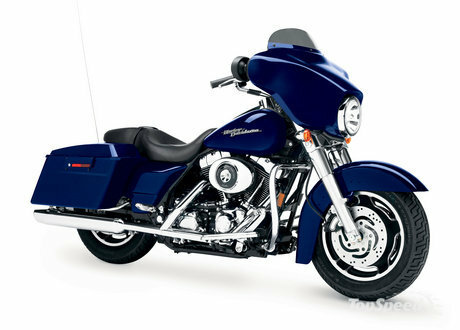 The Street Glide in 2009 comes with a 17" x 3.0" front wheel. The Street Glide in 2010-2013 comes with a 18" x 3.0" front wheel. They both come with a 16" x 5.0" rear wheel. 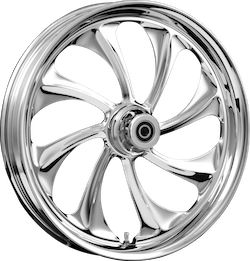 The stock size replacment wheels that we carry in every wheel style on our website is the 17" x 3.5" size front and the 16" x 5.5" rear. If you purchase this size wheel, you can use your stock tires and will not have to change them. On these year Street Glides, you can put a 16 x 3.5, 17 x 3.5, 18 x 3.5, 19 x 3.0, or 21 x 3.5 front wheel without changing anything on the bike at all. 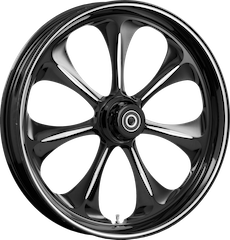 As far as the rear wheel, you can do either a 17 x 6.25 rear wheel with a 200 tire or a 18 x 5.5 rear wheel with a 180/55-18 or 200/50-18 tire. 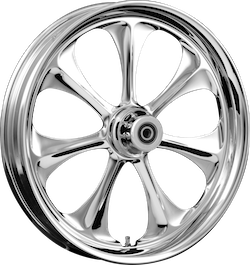 We recommend the 17 x 6.25 because the 200 tire is a better fit for this rim and it looks a LOT better, rides better, and sits at a better ride height. 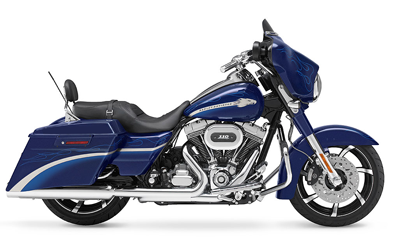 The Street Glide in 2014 comes with a 19" x 3.0" front wheel. 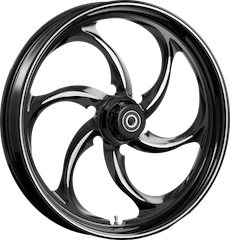 The 2014 Street Glides rear wheel is a 16" x 5.0" rear wheel. 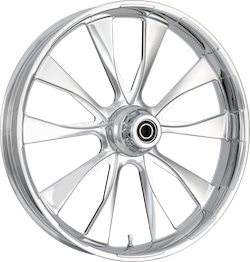 The stock size replacment wheels that we carry in every wheel style on our website is the 19" x 3.0" size front and the 16" x 5.5" rear. 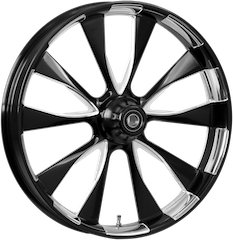 If you purchase this size wheel, you can use your stock tires and will not have to change them. On these year Street Glides, you can replace the stock size wheel with our 19 x 3.0 without changing anything on the bike at all. If you would like to run a 21" wheel... you will need fender risers to raise the fender a 1/2 inch... We can provide these and in some cases, we give them away for free. As far as the rear wheel, you can do either a 17 x 6.25 rear wheel with a 200 tire or a 18 x 5.5 rear wheel with a 180/55-18 or 200/50-18 tire. 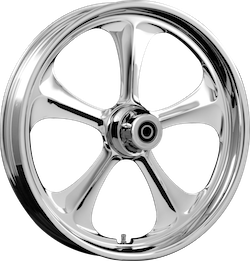 We recommend the 17 x 6.25 because the 200 tire is a better fit for this rim and it looks a LOT better, rides better, and sits at a better ride height. 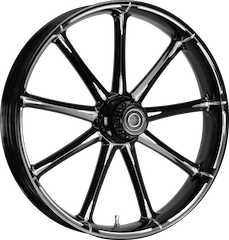 Most of our customers are very surprised to hear that the 21" x 3.5" size front wheel will fit on the the stock Street Glide. All you need for a 2006-2013 Street Glide is a 21 x 3.50 wheel and a 120/70-21 metzeler or avon tire and voila! If you have a 2014 model, you will need fender risers and we can supply them! In some case on the 2006-2013 years, we have heard of customers having to remove the fender and drill the fender mounting holes a drill size larger and put the fender back on. This allows the fender to be pulled up a little bit in the back of it to make sure it does not rub the tire. This is not needed all of the time but you should definitely check the clearances of your stock fender once you install the wheel and tire on the bike. What's needed to put a 23" Wheel on? 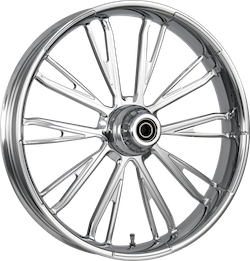 A 23 x 3.75 front wheel will fit on the front of Baggers, but the Triple Trees will need to be changed for the bike to be safe. A replacement fender is recomended because the circumfrence of the 23" wheel doesnt look quite right with the stock fender diameter. You CAN use the stock fender and fit the 23" tire but you will need Fender risers. We carry all of these parts and would be happy to help. Give our knowledgeable sales team a call at 888-926-2793. Will a 23 inch tire fit on the front of a 2000-2015 street glide without changing fender? Yes, it will work with fender risers but the appearance is not to be desired because the fender circumfrence isn't quite large enough for the wheel circumfrence. Fender risers are required for this to work correctly. We carry these risers so contact us and we will help you get what you need!